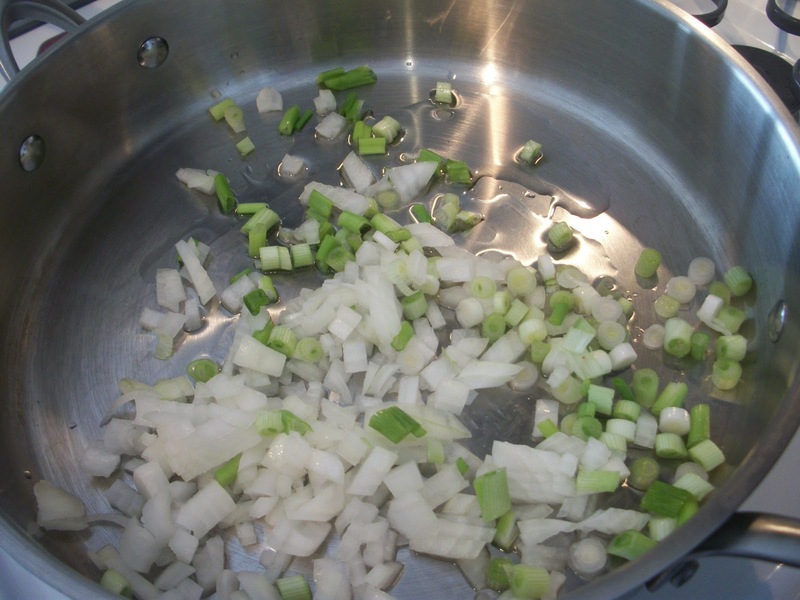 In a large skillet,saute the two kinds of onion in a bit of olive oil until they are soft. Season this mixture to taste with salt and pepper, then set aside while you prepare the shells. 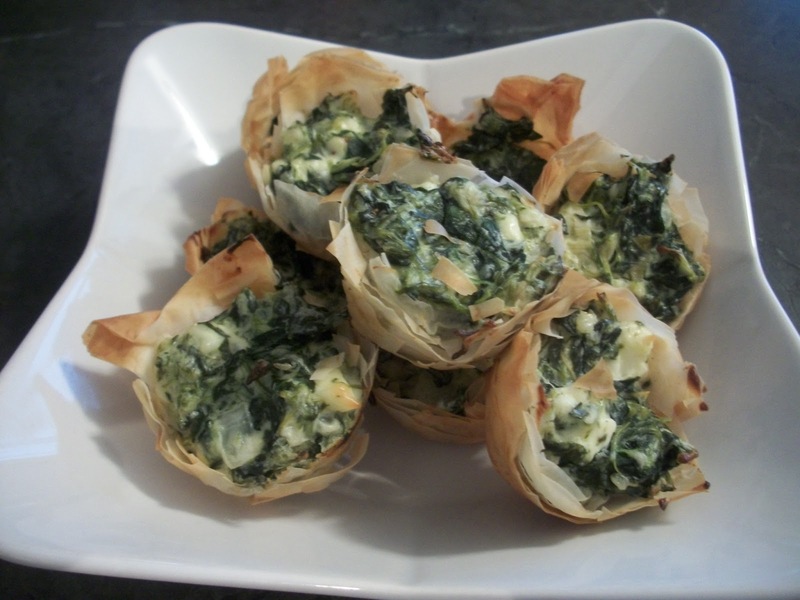 Take the phyllo and put it in a stack. Then cut into 2-inch squares. I used a ruler so I could try to be as accurate as possible! 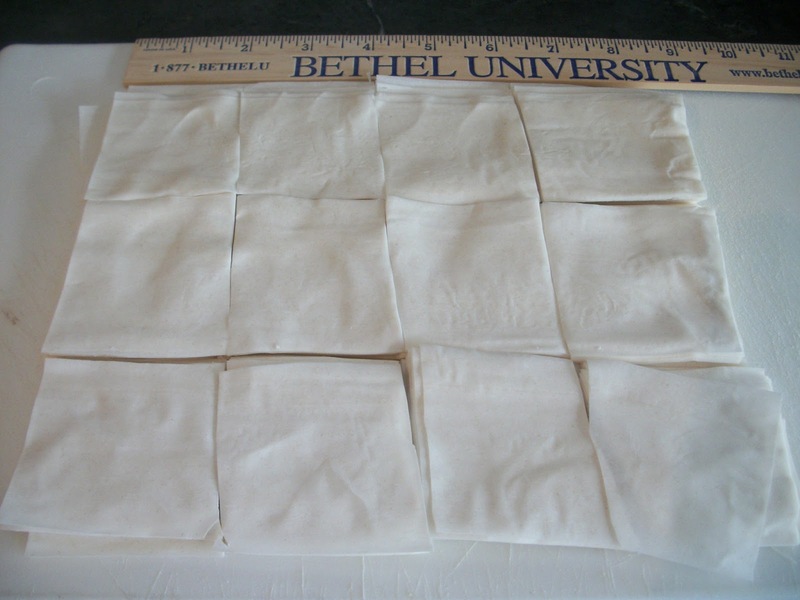 You'll see that I was able to get 12 2-inch squares from my 1/2 pound of phyllo. Now take the melted butter and brush a little of it into each well of your mini muffin tin. 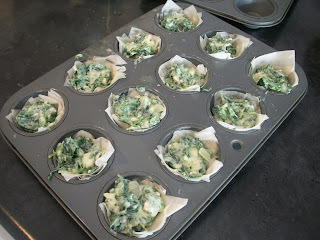 Next, take two of your 2-inch squares of phyllo and tuck them into the muffin tin wells. then add two more squares of phyllo. 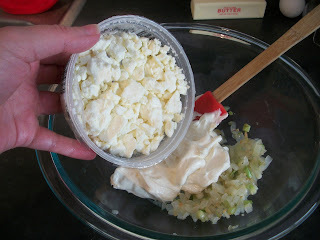 Brush those lightly with butter, top with 2 more squares, and brush those with butter! 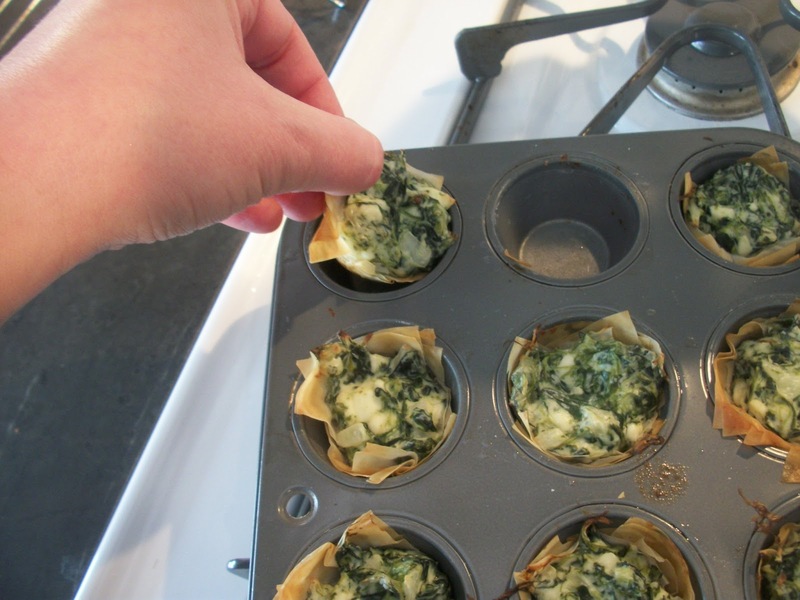 You should now have 6 sheets of phyllo in each well, each set lightly brushed with butter. 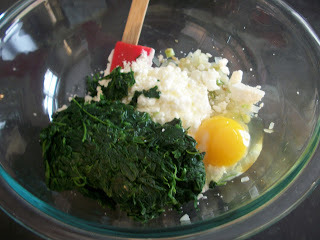 Now fill each well with some of the spinach mixture. Now place the bites in the oven and bake for 15-20 minutes until slightly bubbly and the shells are golden. 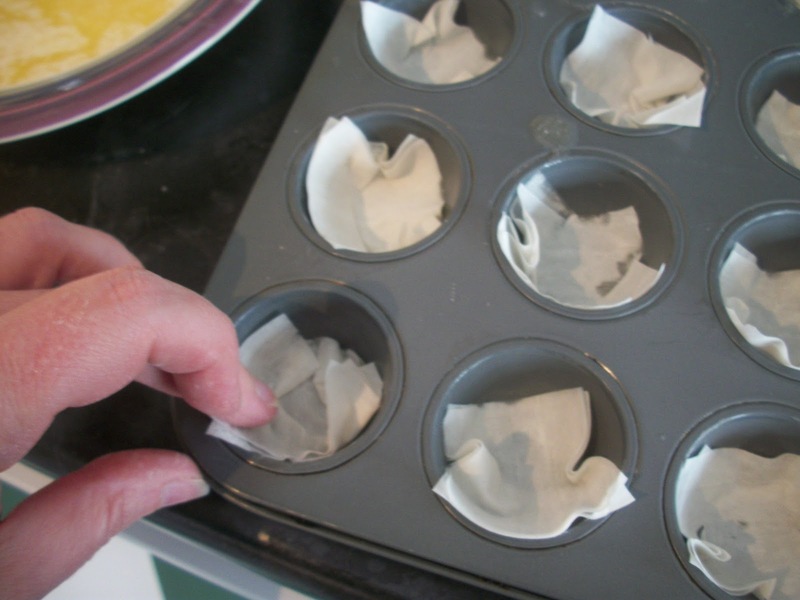 Cool slightly then remove the bites from the pan - I actually just used my fingers to pluck them out, then placed them on a wire rack. Find more great stuff at My Meatless Monday, Mop it Up Monday, Mix it Up Monday, Melt in Your Mouth, On the Menu, Tasty Tuesday, Tasty Tuesday (#2), Tempt my Tummy, Totally Tasty Tuesday, Tasteful Tuesday, Tuesday Talent Show, Clever Chicks, Try a New Recipe, Hearth and Soul, Cast Party Wednesday, Whole Foods Wednesday, Whatcha Whipped Up, What's Cooking, Wednesday Extravaganza, What's Cooking Wednesday (#2), Food on Friday. Heat olive oil in medium skillet over medium heat. Add onions; cook until softened, 3 to 4 minutes. 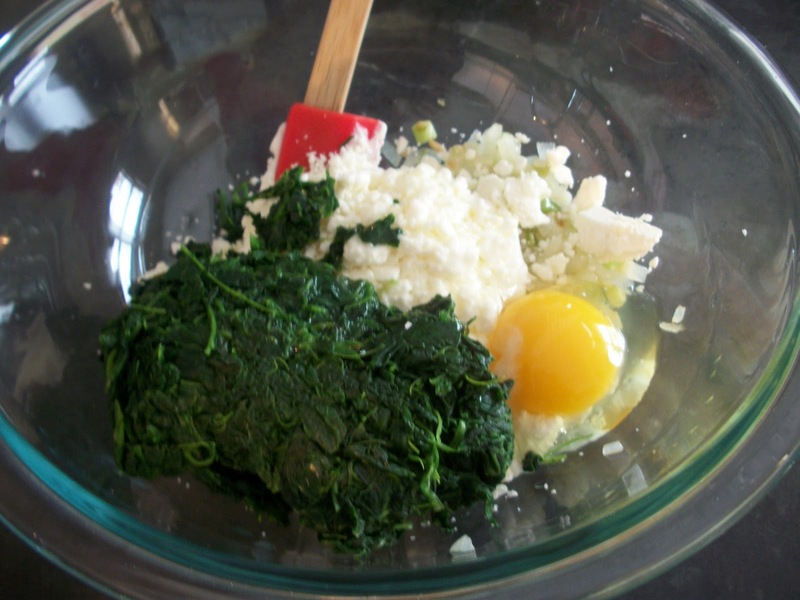 Meanwhile, mix spinach, feta, cream cheese and egg in medium bowl. Add cooked onions and season with salt, and pepper. Remove the phyllo dough from the package and stack up. 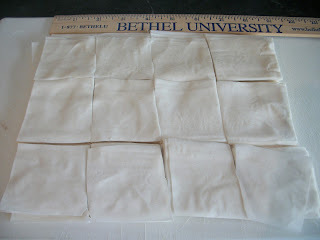 Carefully cut the phyllo dough into 2 inch by 2 inch squares; set aside. 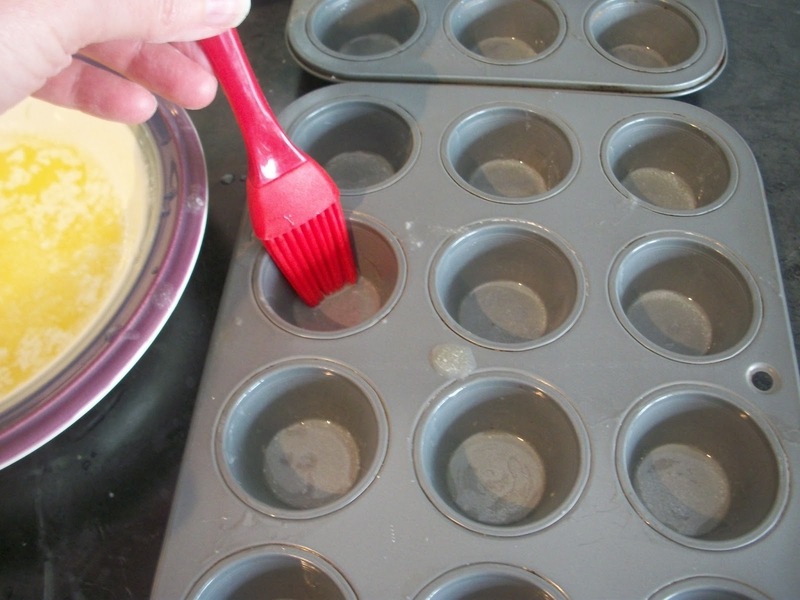 Prepare your mini muffin pan by brushing butter in each well. 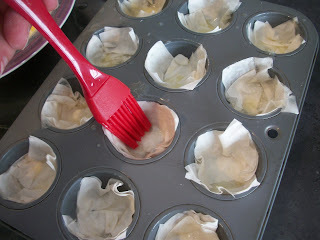 Place 2 squares of phyllo dough into each well, pushing down to create a cup or crust. Brush the top phyllo filled wells with more melted butter and repeat by placing 2 squares of phyllo dough into each well and pushing down to create a cup or crust again, then brushing with butter. Repeat with another layer of 2 squares of phyllo dough and brush with more melted butter. I love this idea and will surely be trying this recipe.........Thank you for sharing with the Clever Chicks Blog Hop this week; I hope you’ll join us again! 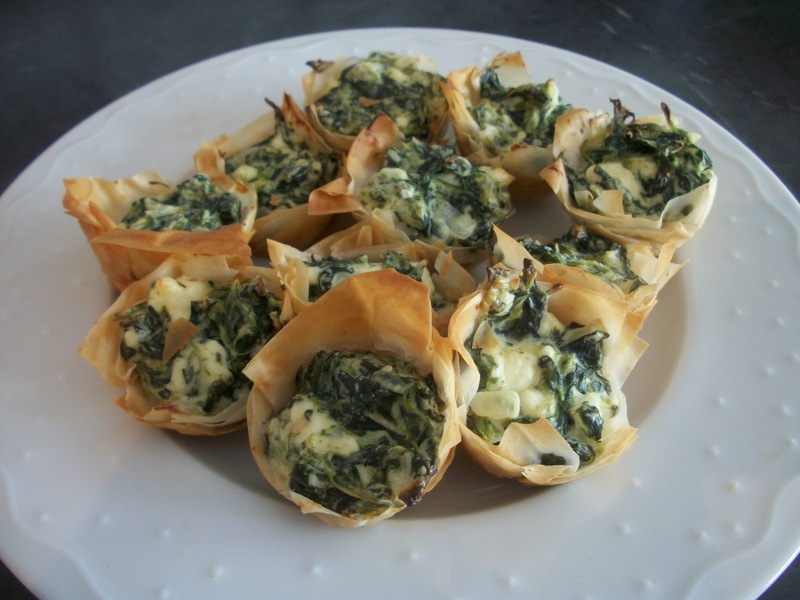 Your Spanakopita Bites look absolutely scrumptious - perfect for a snack, or they'd make wonderful canapés at a cocktail party. Thank you for sharing them with the Hearth and Soul hop. I've shared them on my FB page, and I'm pinning them to my Appetizers board on Pinterest. This is a great appetizer and it is being featured, this week, at My Meatless Mondays. I have to pick up some feta. Just ran out, the other day. Bad timing but I do have the spinach.